A combination of power, speed and design. 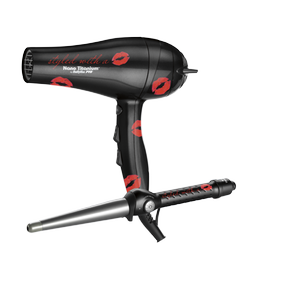 The professional 2000-watt motor dries faster, while an integrated ion generator virtually eliminates frizz to finish hair with brilliant shine. Six heat/speed settings gives stylists total control. This iron's unique tapered barrel - 1 1/4" wide at the handle, 3/4" at the tip - creates any size curl. Sol-Gel technology make the barrel surface 37% harder and 22% smoother than traditional irons. Features 50 heat settings and a turbo-heat boost, up to 450 degrees Fahrenheit. Sign up and receive special offers and news!